ENERCALC provides one software package named the Structural Engineering Library (SEL). That name has been continually in use by ENERCALC since 1983 when we released our first set of 26 Lotus 1-2-3 templates. Although it goes by one name, the Structural Engineering Library is actually dozens of structural engineering design and analysis modules all in one system. 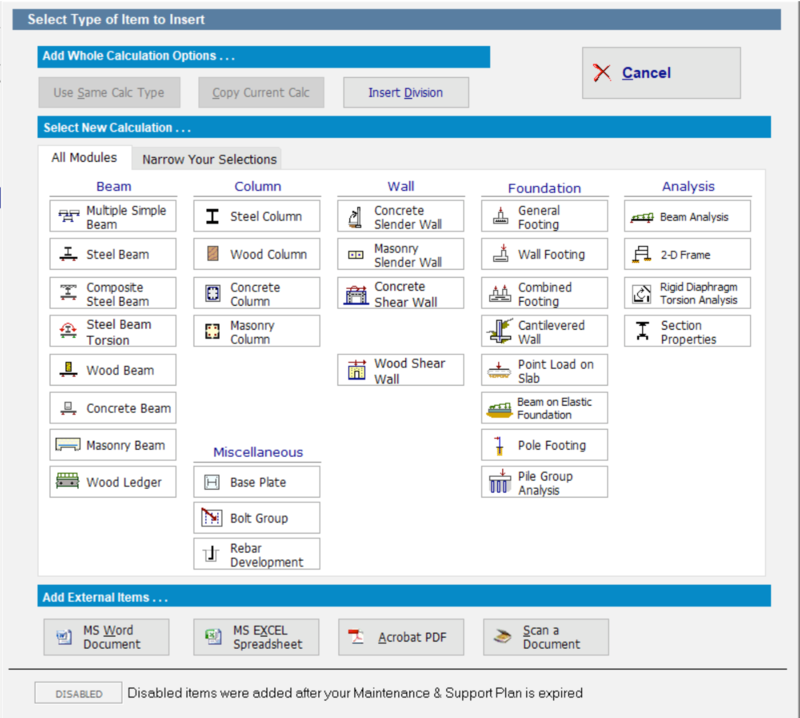 It provides the practicing engineer with a large toolkit of capabilities to design the elements of structures…..and also provides an environment to develop sets of project engineering calculations that contain non-ENERCALC items such as EXCEL spreadsheets, WORD documents, PDF files, scanned images, and general project information. The Structural Engineering Library is a versatile toolkit for the practicing engineer. Small projects of 5 stories or less dominate the structures built nationwide and this is where our software excels. A frame analysis program has its place but all structures require design and analysis of dozens or hundreds of smaller elements that make up the building project. 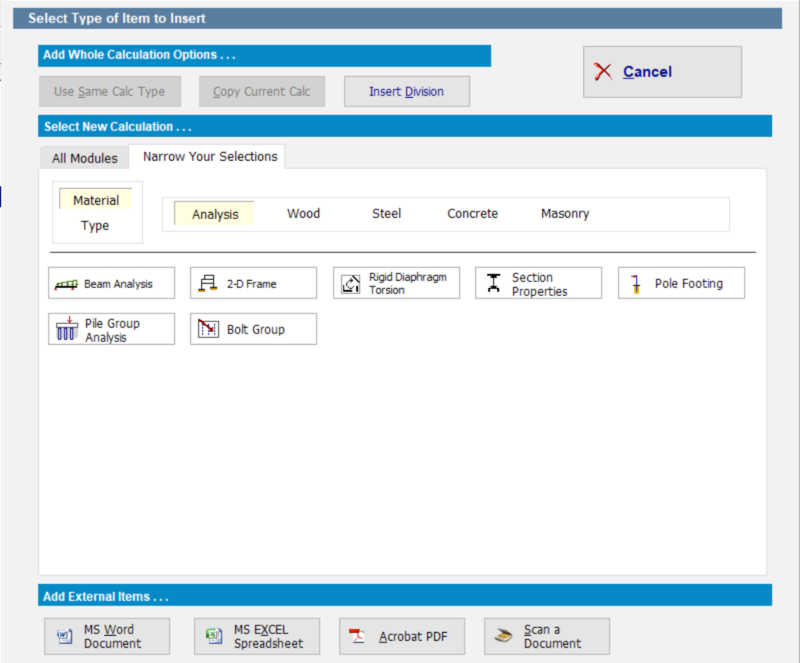 The Structural Engineering Library provides structural capabilities for all common design tasks in steel, concrete, masonry, timber and dozens of other design modules. ENERCALC offers FOUR ways you and your engineering team can leverage the power of our software. You can use the Structural Engineering Library (SEL) by installing it on your computer(s), or access it via the ENERCALC SE Cloud. Structural Engineering Library (SEL) license installed on your computers. Install the software on all of your computers. Includes all updates and technical support while subscription is active. Internet-based license management allows your licenses to follow you anywhere, moving easily between office, home, and laptop - no uninstall necessary. $99/month rate requires upfront payment of $1188 ($99/month * 12 months). Additional seats are $91.67 per month, payable annually. ($91.67/month * 12 months = $1100). Usage ends if subscription is cancelled. We offer a 21 day refund policy for annual subscription initial orders. Recurring charges are not refundable. A two seat subscription is the minimum purchase and is provided at the price of 1 seat. We provide the second seat as a courtesy to allow users to have an activated system at the office and at home. installed version of the Structural Engineering Library (SEL). Subscription begins with a 3 month minimum subscription ($375 for the first 2 seats). After the initial 3 month term, your card is charged each month unless you cancel. IMPORTANT: Expired subscriptions restart with a new 3 month subscription ($375), then go month-to-month. Additional seats are $100 per seat, per month. We offer a 21 day refund policy for monthly subscription initial orders. Recurring monthly charges are not refundable. perpetual license with 30 months of support and updates. Includes all updates and technical support for 30 months. Additional seats are $2955 each. 60 day money-back return period for initial purchase. Structural Engineering Library, RetainPro & ENERCALC 3D Finite Element Modeling (FEM) software. Support & updates included for one low price. No installation required. Use from your browser. Starting in month 4, your card is charged $125 each month (for seat 1) unless you cancel. Initial 3 month subscription for additional seats are $300 ($100/month per seat). Starting in month 4, your card is charged monthly at $100 per additional seat, unless you cancel. IMPORTANT: Expired subscriptions restart with a new 3 month subscription ($375 for seat 1, $300 each for additional seats). We offer a 30 day refund policy for monthly subscription initial orders. Recurring monthly charges are not refundable. Powered by Amazon Web Services (AWS).